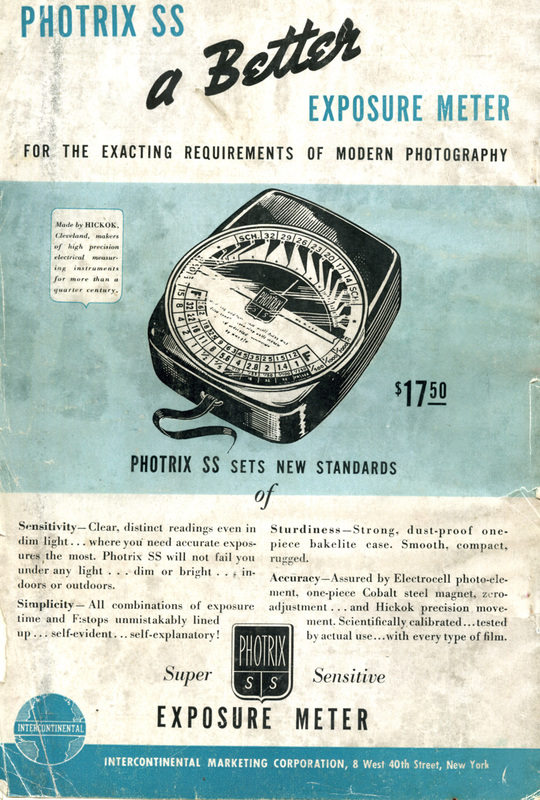 In the early days of light-meter manufacture (at least in the US), the leaders weren't the major camera manufacturers, they were companies that made electrical equipment like Weston and General Electric. 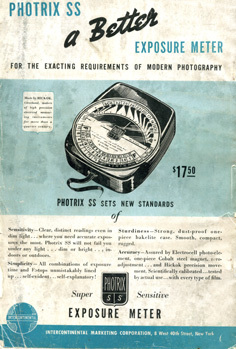 Hickok was another electric instrument manufacturer, and they were once a big name in test equipment. My father was a radio/tv tech and still has some Hickok gear floating around. They made some good stuff. This is the earliest Hickok of which I'm aware. It's very similar to their later Duplex, except that it doesn't have the narrowing front end over the cell. Very simple meter: the needle in the center and the dial revolves around it. The dial is big and easy to read, and the dial is easy to turn with your thumb so it can be used one-handed in either hand (a lot of meters are obviously meant for right-handed users), and everything's on the front so you don't have to flip it over to use the calculator. This is also one of the easiest to use, at least in theory. 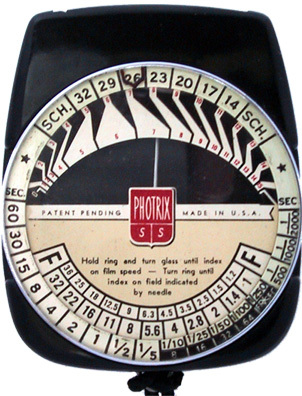 On the glass there's a mark, and you're supposed to hold the glass and turn the dial until the mark covers the exposure index (in American Scheiner), then you can turn the dial and the mark/Scheiner number will follow. You turn the dial so the mark matches up with whichever zone the meter needle is pointing to, and read the shutter/aperture pairs below. The glass on mine is stuck in place, and frankly I don't want to try to loosen it. I have another of these and the dial glass is shattered (I didn't do it), so I think I'll leave it alone. It's heavy for its size, which is bad if you're lugging a lot of equipment or if it's dangling from your neck, but it does give it a feeling of quality that a lot of featherweight meters lack.